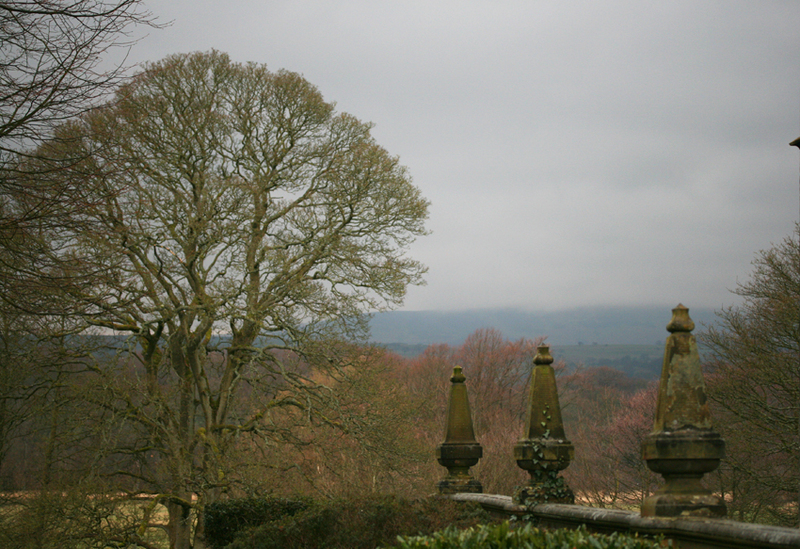 While I was away in Lancashire I popped over to Gawthorpe to see preparations for the new season’s exhibitions. Excitingly for me, my Richard the Roundhead Tam is included, – the first time my work has ever been displayed in a museum or gallery context. 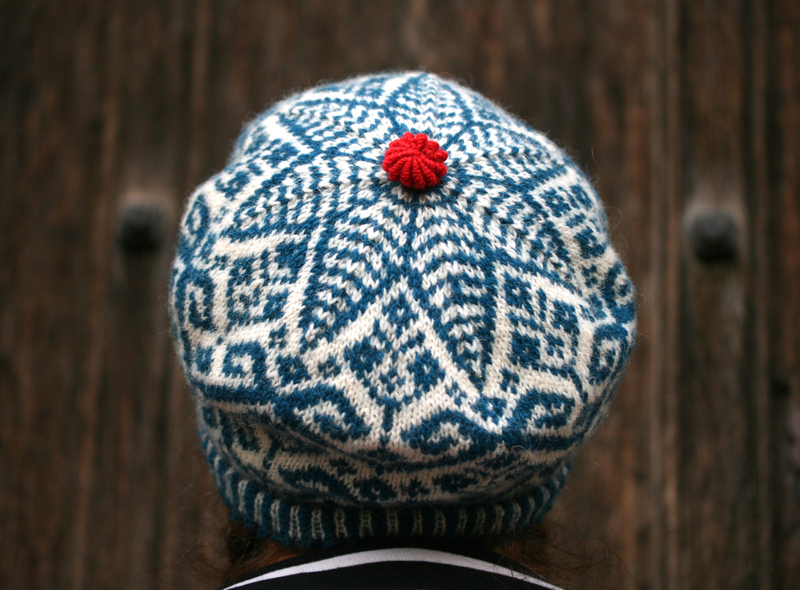 I can tell you that the thought of the tam being exhibited (and examined) weighed on my mind somewhat while I was knitting it, and because of this I was very pernickety with my finishing. I was heartened to read that Emma Varnam also felt similarly when producing her glorious Soliders Quilt Cushion! 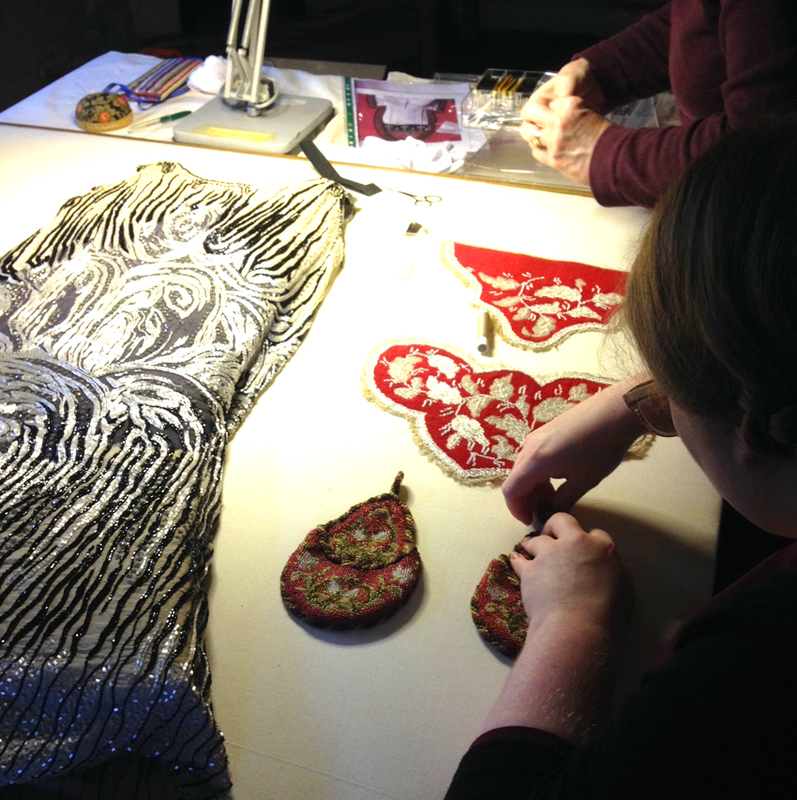 Rachel and her team are hard at work preparing the displays, including the beautiful beaded dress which you can see to the left. The collection includes many wonderful books of lace swatches, including this example, which Rachel Kay Shuttleworth has annotated in characteristically direct fashion. 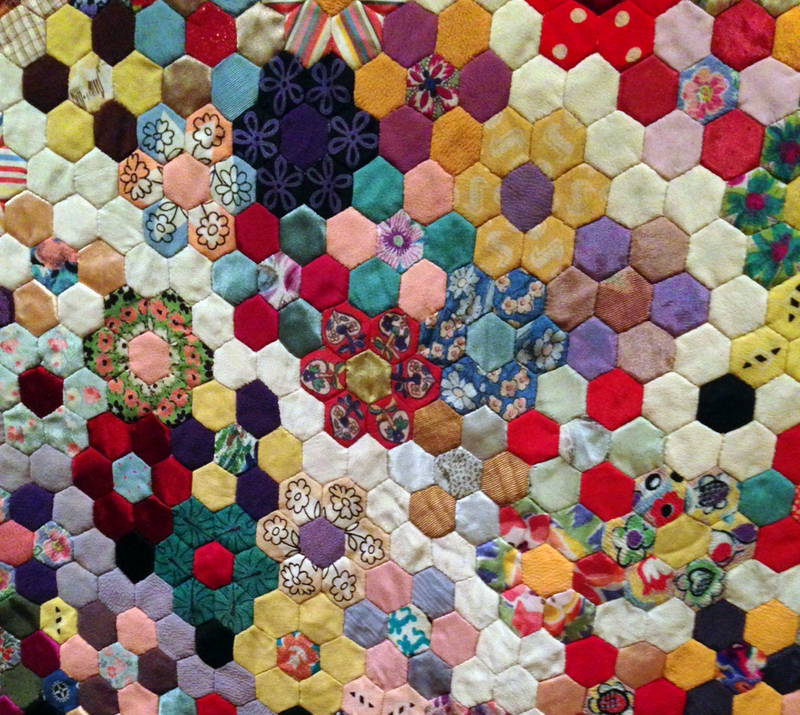 This amazing hexagon quilt is a recent acquisition, and joins the display for the first time this season. Here is Jennie Pitceathly, director of Gawthorpe Textile Collection, who I persuaded to snap a few photographs of me wearing my Richard the Roundhead tam, for you to see. Me and the tam, hanging about outside Gawthorpe’s very imposing front door. . .
Then I said goodbye to the tam, which has now joined its fellows in one of the display cases. I have received quite a few enquiries about the Richard the Roundhead design, and I wanted to be sure you all know about the background of this project. With support from Arts Council England, Gawthorpe commissioned me to produce the pattern, I was paid for this commission, and in return waived all rights in the design. I do not directly sell this design, nor do I profit from it. Its purpose, like the other patterns produced by Debbie Bliss, Emma Varnam, Claire Montgomerie and Jane Ellison, is solely to raise funds for Gawthorpe Textiles Collection. 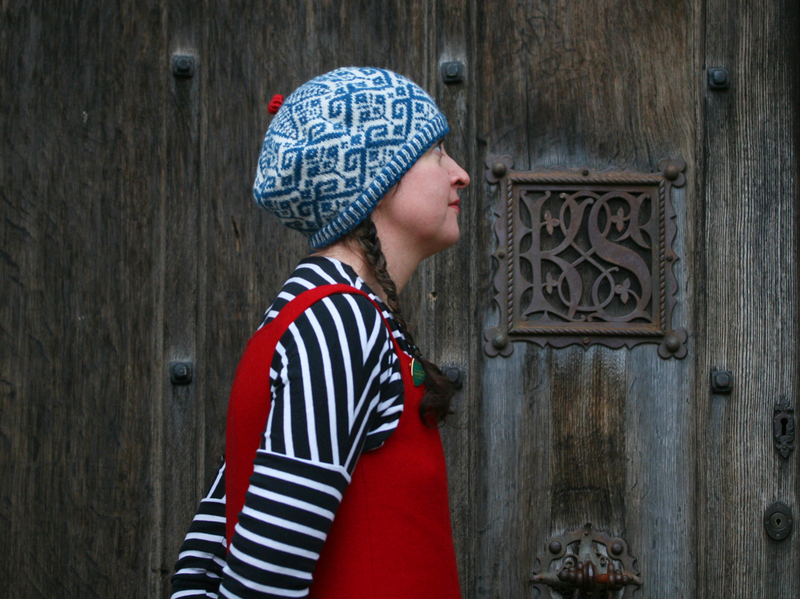 If you purchase this pattern, therefore, you are directly supporting one of the most significant textile collections in the UK, enabling Jennie and Rachel and their team to continue the work that Rachel Kay Shuttleworth began, inspiring future generations about textiles and textile history. If you are a shop with a wholesale enquiry about the Richard the Roundhead pattern, you should contact Gawthorpe Textile Collections directly. 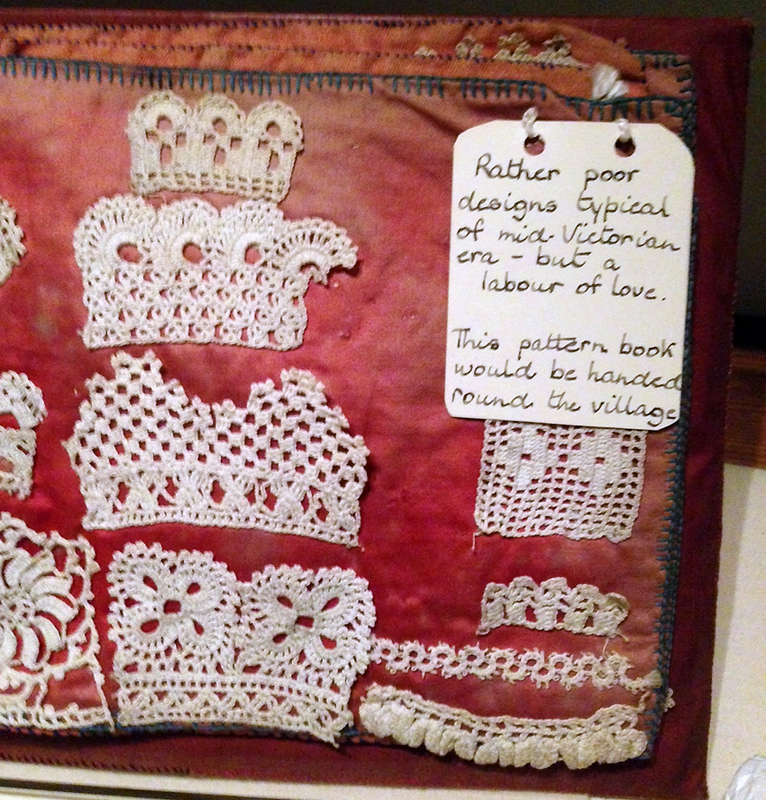 Gawthorpe Hall and its Textile Collection re-opens to the public on March 29th Please do pop along if you can! My heartiest of congratulations on the inclusion of your tam – it just reflects your wonderful “artistry and knowledge” that needs to be shared. I love that your knowledge of textiles is so far reaching and that you share it with us to further it all along! Congratulations! I hope we can fit in a visit in the summer. This whole project makes me so happy. The history, the modern collaboration of artists, and that the Gawthorpe Textiles Collections even exist to make “inspiration, learning, [and] connection” possible…well, it’s all wonderful. The only bigger thrill would be to experience the exhibit in person. Thank you for sharing this. Love the name Gawthorpe. And your tam is amazing … that red button is such a perfect touch. Congrats on being part of the collection! 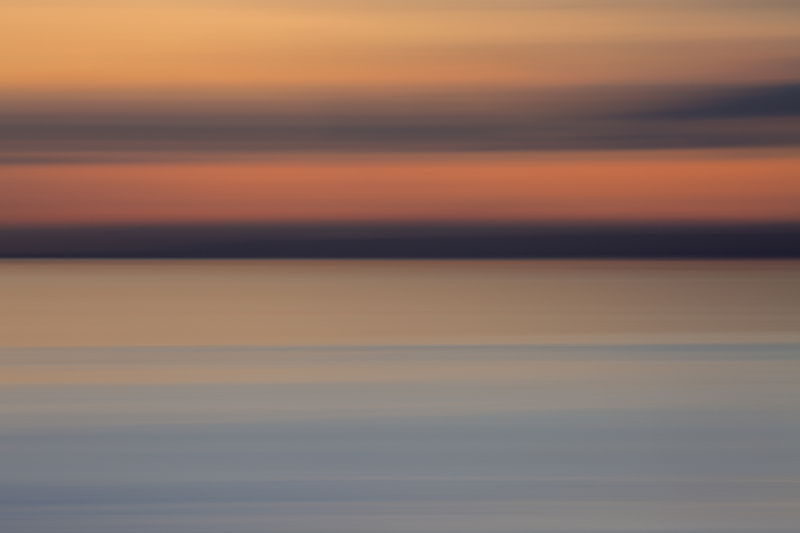 Trying to comment but not being able… if this appears suddenly three times, my apologies. Well done Kate, congratulations. You are now officially part of the national treasury. How good is that! One more reason for me to visit Gawthorpe! Congrats on this wonderful honor. Congratulations, Kate! Your tam is well worthy of the company it keeps at Gawthorpe. 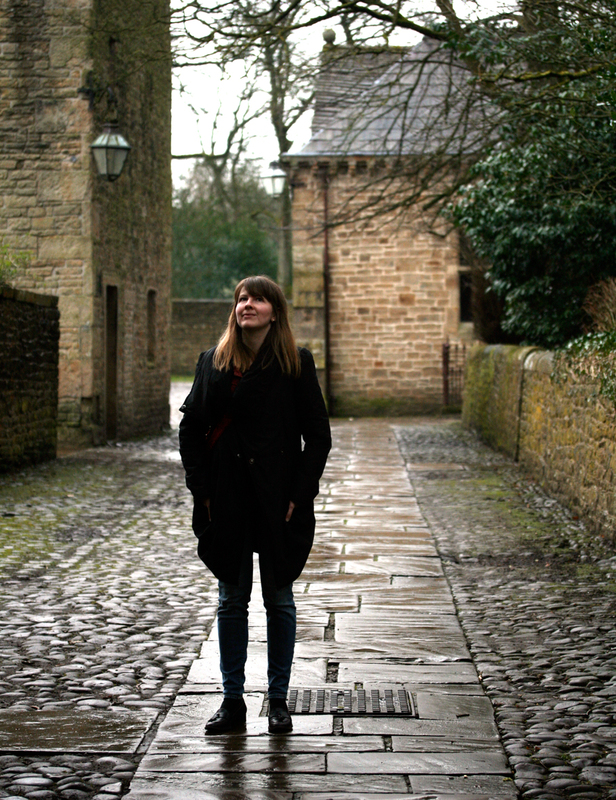 I’m very excited about visiting Gawthorpe sometime this spring. I live just over the border in Yorkshire and didn’t know anything about the place until you wrote about it. I’m afraid I tend to assume that National Trust places are not particularly for me, guess I should rethink that! I love RKS’s comments on the lace. What an interesting character. How exciting is THAT! Well done you. Lovely post and pictures. Thanks for sharing. This looks like a wonderful museum! 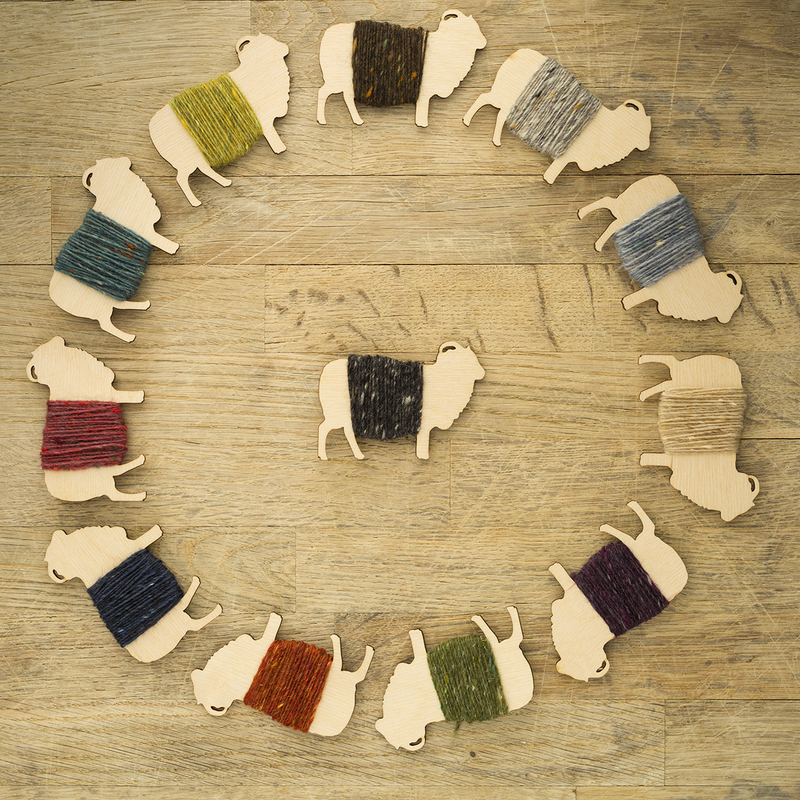 And how great that you are doing what you can to support it with your tam design–it’s really attractive! 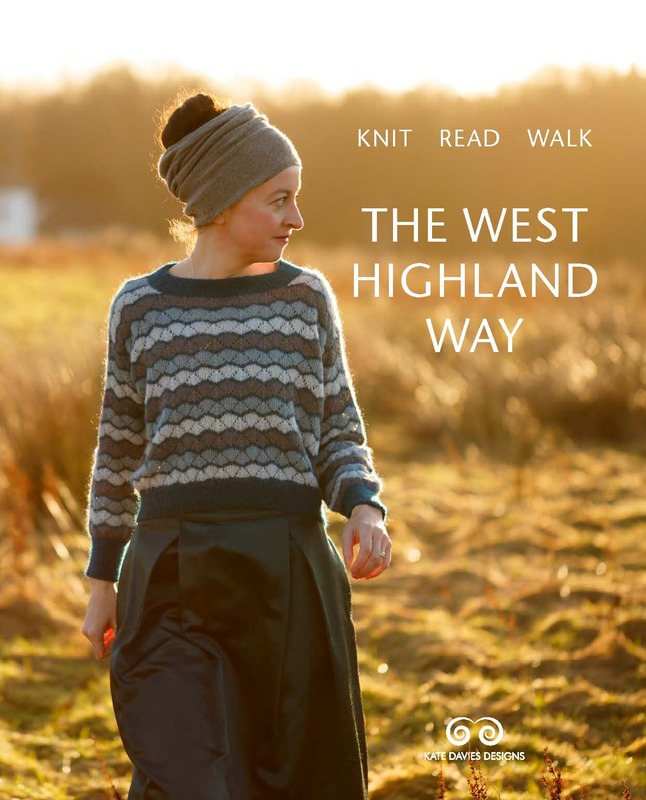 Just seen a mention on TV of a new series of “Shetland” – PLEASE tell us that your knitwear will be taking a starring role again!! Congrats!! Well deserved to raise money and education to the museum. As others hope Bruce is on the mend. Congratulations! How exciting to have your beautiful tam in the collection. Please give Bruce a hug. i hope his nose is better.